The LS3578ER and LS3578FZ from Zebra are two wireless industrial handheld scanners that help you significantly optimise you processes under all demanding conditions. 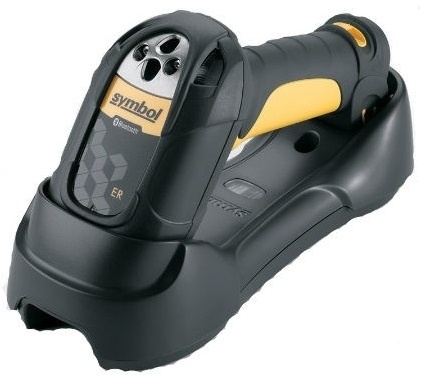 Extremely powerful yet versatile and of course robust - characteristics that allow the use of these scanners in all industrial applications, such as in car fleet management, warehouses, shipping centres, production facilities, or in building supplies and retail. This scanner family was especially designed to meet the needs of demanding applications in production and logistics. Two versions are available, the LS3578ER and the LS3578FZ, which feature different optics. They provide a choice of reliable scanners that can be selected individually for specific customer applications. All versions are equipped with several integrated interfaces that make integration easy. The wireless industrial scanner Zebra LS3578ER offers the largest operating range available on the industry scanner market users scan items at the distance of 10 centimetres to 13.7 metres. Fast switching between bar codes scans on inventory items and collections of small codes in bar code menus and lists is also possible. The second model LS3578FZ uses fuzzy logic to read damaged, dirty or badly printed 1D bar codes often seen in industrial environments quickly and accurately. The integrated Bluetooth interface is responsible for a reliable wireless data transfer between scanner and host computer. Without cables between the scanner and the computer, users can move freely within a radius of 10 metres from the cradle, considerably improving productivity and efficiency by simplifying working processes. Broken cables - often a source of failures with professionally used handheld devices - are definitely a thing of the past with the wireless Zebra LS3578. The integrated WPAN function makes it possible using a Bluetooth connection class 2 v1.2 data is transmitted wirelessly and reliably to all other devices with that standard. Authentication is integrated as well to make sure that the data goes to the correct host. Additionally, selective frequency spread ensures error-free operation within the range of 802.11 networks. Integrated multipoint communication among cradles proves particularly useful if you uses more than one scanner in the same area, one Bluetooth cradle can serve up to three scanners. This not only saves costs, but also reduces the time needed for setup and maintenance. Form and design were optimised with easy handling and long operating times in mind. Especially under demanding conditions, the Zebra LS3578 shows unrivalled ergonomics and an ideal weight that allows prolonged operation without any loss of comfort. At the same time, the Zebra LS3578 is extremely robust, which makes it the perfect choice for scan-intensive applications under demanding industrial conditions. The high degree of resistance against impacts, dust, dirt and water is presented by the scanners IP65 certification. Unsurpassed impact-resistance tests ensure that their reliability is guaranteed any time, even if the device is dropped unintentionally during daily use. The scanners survive even repeated drops onto concrete from a height of 2 metres without damaging the housing, electronics or optics. A protective sealant protects the housing against dust and water splashes, and a very scratch-resistant scan window ensure a maximum service life. Unnecessary down times or expenses for replacements are reduced considerably. The Zebra LS3578 series not only increase employee productivity, but distinguishes itself also with low operating expenses. The robust housing was designed for professional use and a maximum service life. Several integrated interfaces guarantee connectivity to every current and future host system. Using RSM support Remote Scanner Management, the devices can be configured and upgraded centrally, which lowers administrative costs significantly. Even the most durable devices need maintenance. In this case, we provide the extensive Enterprise Mobility Services programme. Protect your investments and gain maximum operational performance.